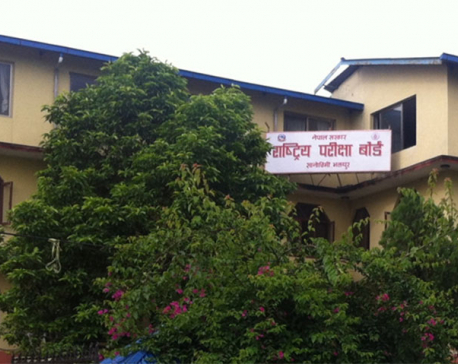 KATHMANDU, June 25: The Office of the Controller of Examinations (OCE) failed to provide the detailed results of the Secondary Education Examinations (SEE) even on Sunday, a day after the results were made public. According to OCE officials, detailed SEE results will be possible only after about a week. The OCE published the SEE results at around 8 pm on Saturday, four hours later than the scheduled time of 4 pm. Of the total 463,689 students who appeared in the SEE held in April this year, the number of students scoring a GPA of 0.85 to 1.20 is 58,688, which is almost 10 per cent more than the number of students securing the same GPA in last year’s SEE. However, OCE officials failed even on Sunday to provide the subject-wise details of SEE results, citing ‘system error’. “The results were published four hours later than the scheduled time due to technical problems,” said Ambika Prasad Regmi, controller at OCE. At a time when SEE results have been falling every year after the implementation of the letter grading system two years ago, the number of students getting lower grades in English, Math and Science is increasing annually. However, the OCE has failed to provide the details of subject-wise ranks. The percentage of students obtaining a GPA of 0.85 to 1.20 stands at a whopping 13 percent this year, compared to just 2.53 percent last year. The number of students securing a GPA of 1.25 to 1.6 has decreased, compared to the last year. Last year, the percentage of students getting a GPA of 1.25 to 1.6 was 14.49 percent, compared to 7.88 percent this year. Similarly, 13.7 percent students got a GPA of 2.05 to 2.4 this year, seven percent less than the figures of the last year.